The policy of ‘start low, go slow’ is key to patient management when prescribing analgesics, anti-inflammatories, antidepressants, and many other drug classes. Simply put the ability to titrate to effect, balancing adverse events with efficacy, is crucial: first do no harm. Until now to achieve such control with extended release tablets required multiple tablets of increasing dosage strength – a process both expensive and prone to errors from all concerned. Should patients break extended release tablets, for example, over-exposure or ‘dose dumping’ would occur. Altus’ patented FLEXITAB technology safely eliminates the need for multiple tablets enabling for the first time scored extended release tablets that may be broken into multiple pieces each part with same performance as the intact tablet; FLEXITAB tablets don’t dose dump. With FLEXITAB patients may be titrated simply from just one tablet in a cost-effective and safe manner. FLEXITAB permits cost-effective differentiation. New class labeling has been obtained from FDA recognizing FLEXITAB’s unique features on the basis of pharmacokinetic studies alone. As typified by Altus’ high dosage strength formulation of a common over-the counter analgesic, FLEXITAB allows controlled release tablets containing over 1000mg of drug in pharmaceutically elegant formulations that may be scored and broken for easy titration and easier swallowing. 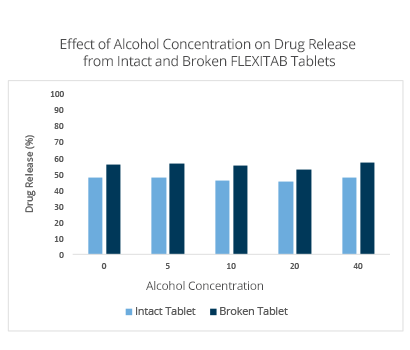 FLEXITAB tablets whether intact or broken are unaffected by alcohol even after prolonged exposure. 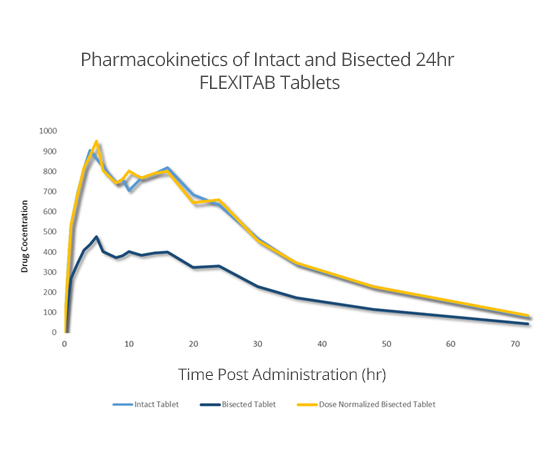 After six hours of stirring at body temperature in up to 40% ethanol, FLEXITAB tablets remain robust with no change in the amount of drug released. FLEXITAB tablets and caplets may be broken precisely and easily by the patient. 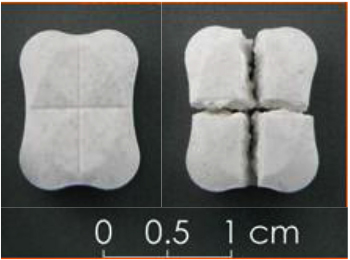 Tablets may be round, caplet shaped or quartic with one or two scores to generate up to 4 portions of equal or unequal dose as required. 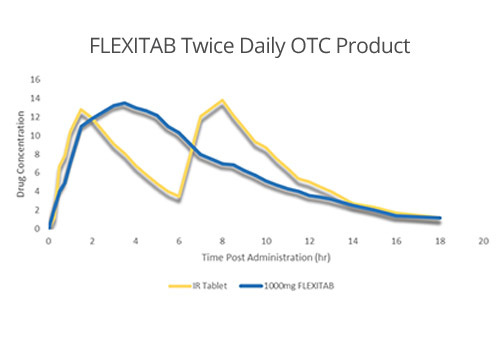 The high drug loading capacity of FLEXITAB (up to 70% of tablet content) keeps tablets small and elegant. FLEXITAB tablets are made with conventional equipment and employ only simple safe ingredients.